RRB NTPC stage 2 exam 2016: Results under process, not releasing in March RRB NTPC stage 2 exam 2016: The candidates who have appeared for the Non-Technical Popular Category(NTPC) second stage examination(CBT) have a long wait to find out how they scored. 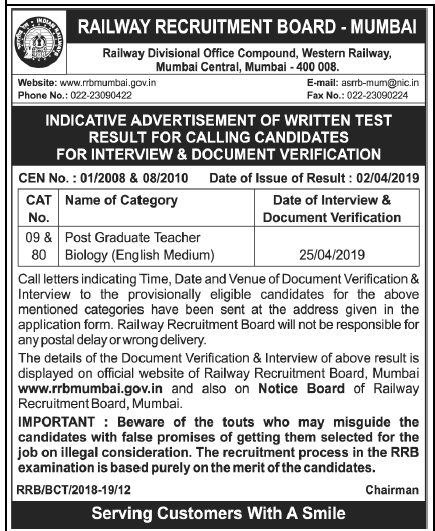 The Railway Recruitment Board(RRB) has not released the results this month. As per the official sources, the result is under process. The exam was held on January 17, 18 and 19, 2017 to fill 18,252 vacancies in various technical and non-technical posts of RRB. There were over 56 lakh candidates who had applied for the stage one exam. More than three lakh candidates qualified for stage two. 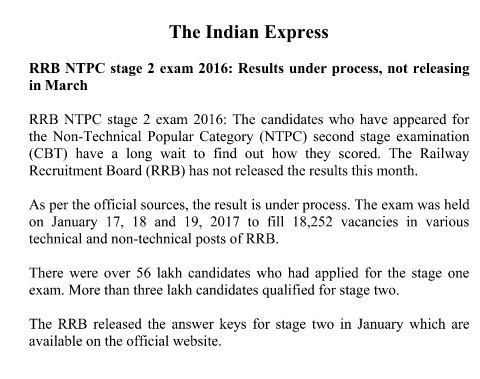 The RRB released the answer keys for stage two in January which are Available on Official website.